This graph may looks a bit scary, so we’ll detail the role of each component below. This refers to Funkwhale’s built-in web interface, which is a Single Page application written in Vue JS. This application will interact with Funkwhale’s API to retrieve or persist data. Since Funkwhale implements a subset of the Subsonic API, it’s compatible with existing apps such as DSub, Ultrasonic or Clementine that support this API. Those apps can be used as a replacement or in conjunction of the web interface, but the underlying data is the same. Funkwhale’s API server is the central piece of the project. This component is responsible for answering and processing user requests, manipulate data from the database, send long-running tasks to workers, etc. Most of the data such as user accounts, favorites, music metadata or playlist is stored in a PostgreSQL database. Fetching data from the database is sometimes slow or resource hungry. To reduce the load, Redis act as a cache for data that is considerably faster than a database. It is also a message queue that will deliver tasks to the worker. Some operations are too long to live in the HTTP request/response cycle. Typically, importing a bunch of uploaded tracks could take a minute or two. 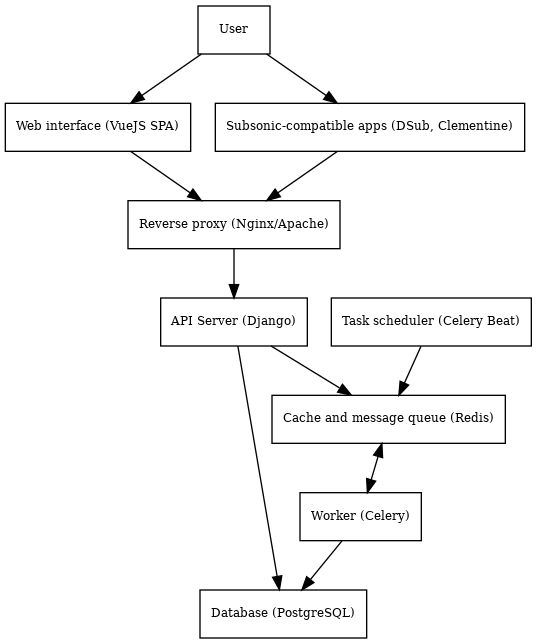 To keep the API response time as fast as possible, we offload long-running tasks to a background process, also known as the Celery worker. This worker is also able to retry failed tasks, or spawn automatically more process when the number of received tasks increase. Some long-running tasks are not triggered by user or external input, but on a recurring basis instead. The scheduler is responsible for triggering those tasks and put the corresponding messages in the message queue so the worker can process them.